My mum has lots of books by Dallas Clayton because she thinks he's cool. She said people say he's like the modern day Dr Seuss and I can see why. This book contains the alphabet with names describing the letter. 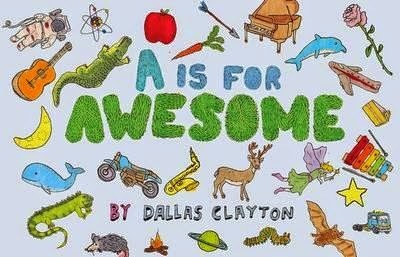 For example, A is for Awesome, like the title of the book. Then other letters stand for other cool words like brazen and beautiful, cool and collected. There are drawings of things that start with the letter of the alphabet but mostly the focus is on the words, which is unusual for an ABC book. I think this book is perfect for youth readers in preschool who can understand the alphabet and will then understand the words better. Dallas has made this book stand out by putting lots of illustrations and colourful, bold text, and added unique fonts. He has put feelings and emotions into the book. I say kids from any age will enjoy this book. Adults can enjoy this book too because of its kooky designs, and the use of energetic adjectives. The price is good so you better not hesitate. Go to your local bookstore now!